The iPhone 4 went on sale around the globe on Thursday morning, starting in Japan where customers who waited in long lines became among the first to purchase the latest smartphone from Apple. 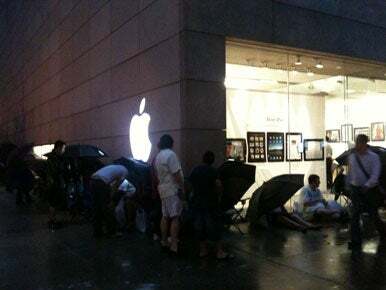 Hundreds of people waited in lines outside a Tokyo store owned by operator Softbank Mobile and Apple’s Ginza outlet, including some people who’d camped out overnight in anticipation of buying the new phone, the Nikkei Keizai Shinbun newspaper reported on its English Web site. The iPhone 4 went on sale at 8 a.m., Tokyo time. In the U.S., the smartphone is priced at $199 for a 16GB model and at $299 for a 32GB model, with two-year data plans. AT&T iPhone customers in the U.S. are eligible for that pricing if their current contract expires any time in 2010. The iPhone 4 has already been declared a success prior to the device’s availability in stores, but not without some hiccups. Apple and its U.S. carrier partner AT&T started taking iPhone preorders on June 15, but a big rush caused online ordering systems to collapse, leaving potential buyers frustrated and angry. AT&T suspended taking orders the next day and Apple apologized to users, saying that demand for the iPhone 4 was “far higher than we anticipated.” Apple and AT&T had taken orders for more than 600,000 iPhones, Apple said. “First of all, the screen is so beautiful that you can’t even see the dots,” said Manayabu Ishiyama, who stood in a line outside a Softbank store in Tokyo. He was looking to upgrade from an iPhone 3G S.
“I realize there are more important things going on in the world right now, but it’s kind of fun to be out here,” said Curtis Glavin, who was first in the Boston line. The device includes a front-facing video camera for videoconferencing, a faster processor and improved multimedia capabilities. It promises longer battery life compared to earlier models, offering seven hours of talk time and six hours of Web browsing time over 3G networks. It also offers 10 hours of browsing over Wi-Fi networks, 10 hours of video playback and 40 hours of music listening. The new chip and front-facing video camera add strong multimedia capabilities that earlier models lacked. The smartphone will be able to record 720p video at 30 frames per second. For videoconferencing, Apple has introduced the FaceTime application for video calls, which will work over Wi-Fi networks for now. Apple CEO Steve Jobs has said the company “needs to work” with carriers for the application to operate over cellular networks. The phone will run iOS 4, which brings multitasking capabilities to Apple’s phones. Previous phones were able to run only selected applications at the same time. Sumner Lemon, in Singapore, and Peter Sayer, in Paris, contributed to this story. Updated at 6:05 a.m. PT on June 24 to include information from Paris.